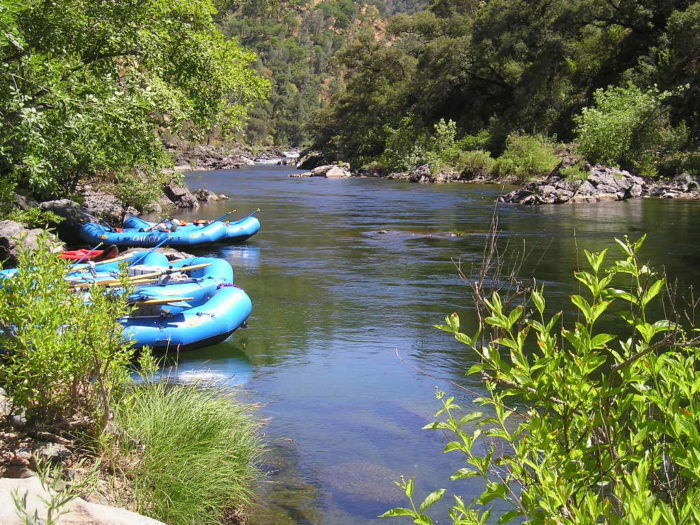 In 1982 I got a call from my friend Ken asking me if I wanted to join him, his brother Bruce and Bruce’s wife Sue on a 4 day rafting trip down the soon-to-be dammed and absolutely gorgeous Tolumne River in the Sierra Nevada mountains. Ken had booked the trip six months previously but his wife Sara had gotten pregnant in the interim and couldn’t risk an accident. Ken said this was a luxury trip that included all meals cooked by the chef of Chez Panis, one of the finest restaurants in San Francisco.. Not a bad perk, eh? We started out at the launch site and were given a choice between sitting without paddles or oars in giant raft controlled by an oarsman in the rear or paddling our own raft with a guide. We chose the latter, naturally. After 20 minutes or so giving us instructions on raft control and emergency procedures our guide was satisfied that we could safely navigate the raft through the currents and rocks that made this Force 5 river a serious test of our abilities. We were all good athletes and swimmers at the time, the sun was hot, the river was ice cold and the scenery was spectacular, so off we went. The first day was an absolute joy as we rocked & rolled downstream through the tree-lined canyons, avoiding rocks and flotsam and quickly learning how to move the raft as a team. Camping on a small beach by the river that night we feasted on salmon and vegetables and some great California wine. We slept like babies under the stars after a physically challenging day and woke to a magical morning filled with sparking sunshine. Fortified with delicious blueberry pancakes and maple syrup we headed out for the next leg of the trip. Our guides explained to us that this leg included an option of going over or safely around a 12 foot waterfall, Clavey Falls. We were told that if we choose the falls experience there was a good chance that we could end up dumped from the raft and find ourselves at the bottom of the falls in a deep hole created by centuries of pounding water. He said we should not panic if that happened, but should just relax, let the action of the river wash us out as if we were in the spin cycle of a giant washing machine and we would pop up just downstream. We opted for the falls. Halfway down the falls the raft capsized and we all tumbled out and so I found myself in the bottom of the pit looking up at the sky through 12 feet of freezing, swirling water. I remembered to relax and I let the water wash me out, just like I was told. I popped up downstream aways, but I was sucked back down to the stream bed three times before a big hand reached down and plucked me from roaring rapids. Ken and Bruce were already in the rescue raft, but there was no sign of Sue anywhere, until we heard her calling. Amazingly she had fought her way to a rock face abutting the river and had climbed straight up, clinging to the side of the rock face about 15 feet from the river surface! Sue had been a prima ballerina and was very strong and fearless, so this was feat none of us could have imagined doing. After this wildness we regarded ourselves as baptized and veteran rafters. The river kept taking us downstream through the spectacular Tolumne gorge for two more days of wonderful paddling, sights and sounds, delicious food and peaceful nights until we finally reached the take out area. I don’t know if the damn was ever put in place on the Tolumne, but I surely hope not as it was one of the most beautiful places on earth. Sara had baby girl 7 months later.